September’s programming theme at The Cinefamily is “kids’ cinema,” so my cohort Sebastian O’Brien and I thought it would be fun to run with that ball and screen one of the best kid-oriented horror films around, Tibor Takács’s spooky crazy good time, The Gate — soon to be remade by Bill & Ted‘s Alex Winter. And director Tibor Takács will be delighting our audience with a Q&A! 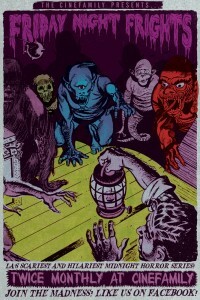 From the golden era of cinema’s small horrible creatures (Gremlins, Ghoulies, Gary Coleman, etc.) comes The Gate, a film which remains just as genuinely spooky and cool as from when it first primed your childhood nightmares! In his feature debut, Stephen Dorff plays a precocious kiddie who accidentally unleashes the gate to Hades in his Spielbergian suburban backyard. Exploring the same haunting, hallucinatory territory of Phantasm or the original Evil Dead, and containing a very large number of indelible freaky images, The Gate is special due to its comittment to unsettle you; not satisfied with merely presenting a torrent of demonic little homunculi (portrayed incredibly by actors in suits rendered tiny and hellish through forced-perspective and other camera tricks), director Tibor Takács also turns up the moody burn to a fever pitch, and doesn’t skimp on the legitimate, non-kid-friendly scares. Also, it is a well established fact that any movie that uses a Satanic Heavy Metal record as a plot device is awesome. Don’t be late…for The Gate! Dir. Tibor Takacs, 1987, 35mm, 85 min. 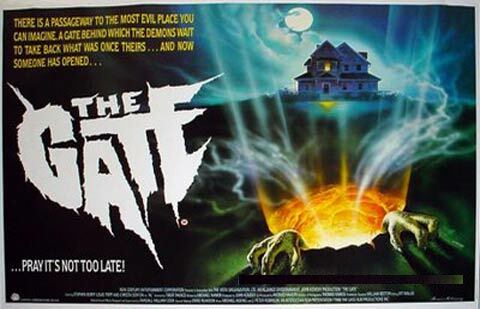 And don’t forget to check out our original FNF trailer for The Gate! As always I am giving away some free tickets (each with a +1) as well as a reserved couch for the first place winner. To enter all you need to do is send an email to wormmiller@gmail.com with THE GATE in the subject line and tell me what scared you most as a child? Include your full name. I will only be contacting the winners. Coming soon, Calvin Reeder’s The Oregonian!